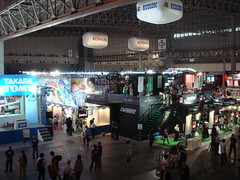 Minmaxing Life » TGS 07 roundup. To say that I was disappointed with the event would be a vast understatement. More and more I feel like video games trade shows are a complete waste of time and energy. 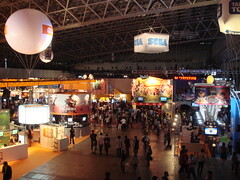 After seeing the meretricious lines of gaudy stands displaying almost nothing but stale games – although fabulously well executed in some cases – I’m convinced TGS deserves to disappear just as much as E3. These were the only titles that caught my eye and attention. Sadly, I’d heard of three out of four long before setting foot at the show: the PC prototype of Echochrome has been downloadable for a while, Media Molecule’s game was announced at GDC 07 and Eye of Judgment at last year’s TGS. Thus, only Patapon, a sort of Lemmings crossed with Donkey Konga with amusing 2D graphics, was really new to me. It definitely looked interesting but not enough to wait for hours in a line to try it. I’ve heard it’s done by the LocoRoco team so maybe that explains why Cocoreccho on PS3 is such a let down: perhaps they were too busy working on Patapon. Also worth noting in the “not-completely-dull” department: Time Hollow, an RPG made specifically for the DS by Konami. Not exactly my cup of tea but at least it looks like they tried to be creative by using time as both a game mechanic and story element. It was the biggest booth dedicated to a single DS game and had a lavish 6 pages color brochure so Konami must really believe in it. I’ll probably give it a shot if it’s ever released outside Japan. Finally, in the “remixed-oldies-and-nostalgia” department, I have to admit it’s good to see Ikaruga on the DS and Nights finding his way on the Wii.